FALL!!!! With high pressure sat firmly over Scandinavia and the magic combination of strong south-easterlies and heavily overcast skies with occasional drizzle we were treated to a a great days birding. Thrushes arrived in force, there were a number of highlights and leading the way was the fourth record of Smew for North Ronaldsay - a redhead (perhaps 1st winter or moulting drake?) on Bewan Loch briefly. The Northern Harrier was seen a few times and a Great Grey Shrike was discovered as it came into roost at Holland gardens at dusk and promptly devoured an unfortunate Goldcrest! 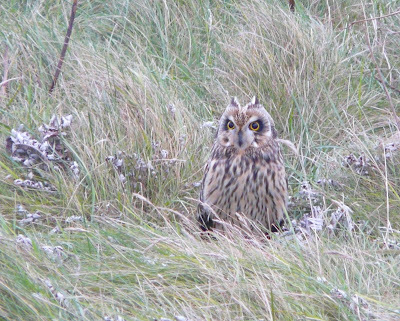 Without doubt the most impressive spectacle of the day though was a mass arrival of 22 Short-eared Owls and 5 Long-eared Owls! The count for the former species is double the pervious high and included groups of 8 together on Torness and 9 in the fields between the Lighthouse and Senness - a fantastic sight! Fieldfares were the most conspicuous of thrushes as large flocks filtered through the island and out to sea to the south. A total of 2525 will have been an underestimate and there was also a Ring Ouzel, 124 Blackbirds, 81 Song Thrushes and 1114 Redwings. 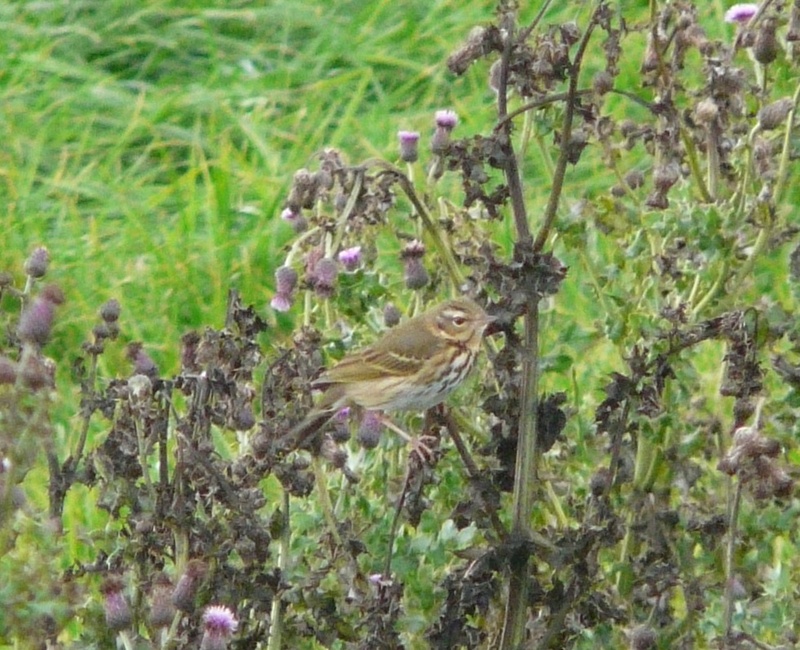 Other birds seen on a busy day were 4 Woodpigeons, a Large Pipit sp. south and out to sea with thrushes at the Observatory, 13 Blackcaps, 9 Chiffchaffs, a Siberian Chiffchaff, 24 Goldcrests, the Pied Flycatcher, a Chaffinch, 22 Bramblings, a male Crossbill, Lapland Bunting and 8 Snow Buntings. Along with the rare 'sawbill' there was a big influx of wildfowl with 430 Wigeon, 21 Gadwall, 234 Teal, 7 Pintail, 392 Eiders, 7 Long-tailed Ducks and 5 Goldeneyes. 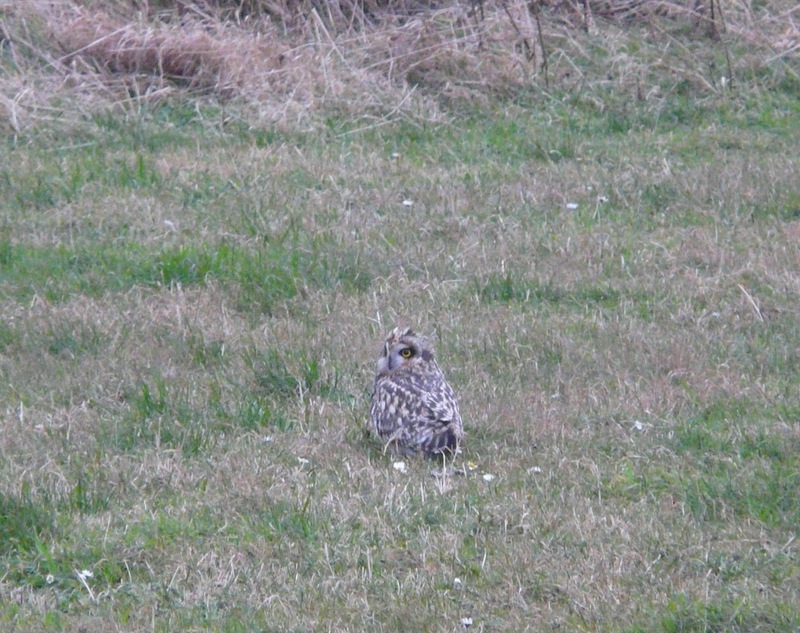 A couple of juvenile Hen Harriers toured the isle, the Whimbrel remains and 8 Jack Snipes and 13 Woodcocks were found. As with yesterday there were large numbers of Gulls feeding in the swell again with 12 Black-headed Gulls, 483 Common Gulls, 304 Herring Gulls and 286 Great black-backed Gulls counted. High tides and a rough swell saw the birding more akin to the winter months as numbers of coastal feeding waders, wildfowl and gulls built up for the first time since the early part of the year. There were about 200 each of Common, Herring and Great black-backed Gulls, plus 14 Black-headed Gulls, 221 Eiders, 158 Purple Sandpipers and 248 Turnstones mainly on or off the eastern shores. 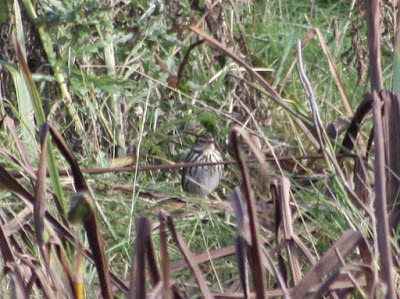 The Northern Harrier remains, 4 each of Jack Snipe and Woodcock were flushed and of other migrants the most notable were 43 Rock Pipits, 2 Wheatears, fewer thrushes than yesterday, a late Pied Flycatcher at Holland gardens, 15 Bramblings and a Mealy Redpoll. On the whole things remained quiet but there were some signs of change today, in particular once the sun came out mid-morning when some new arrivals became evident. Passerine numbers were much improved on the last few days with a small flurry of Thrushes including 26 Blackbirds, 57 Fieldfares and 240 Redwings perhaps the forerunners of a late rush of birds in the more favourable winds forecast for this week? 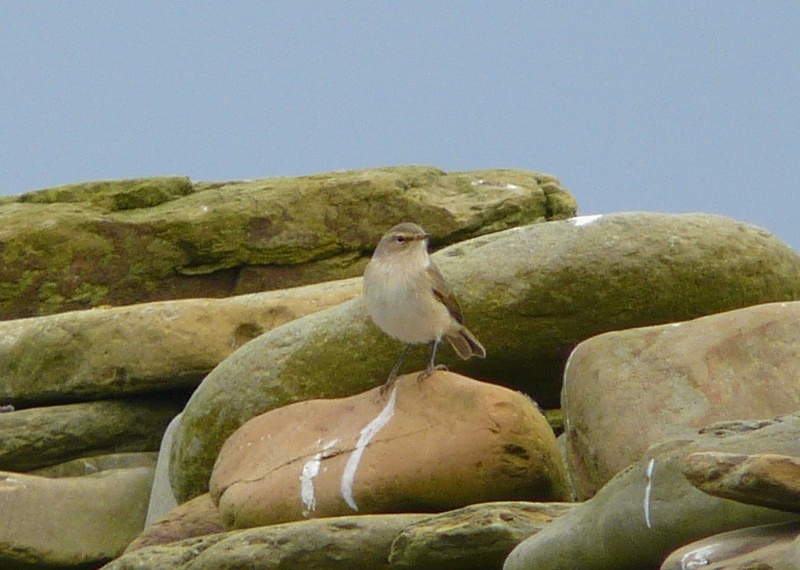 There were also a couple of Woodcocks, 4 Wheatears, 5 Blackcaps, a Chiffchaff, 5 Goldcrests, the Spotted Flycatcher, 9 Bramblings and 3 Chaffinches. 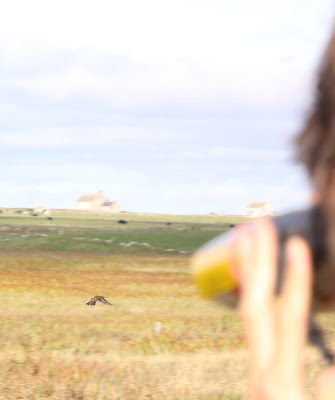 The long-staying male Northern Harrier, juvenile Hen Harrier and Whimbrel were all seen again and 6 Sooty Shearwaters were the best the sea could offer in a half hour watch. Despite heavy rain in the morning, a handful of new birds were found on the 24th the best of which was a juvenile Glaucous Gull which passed the north end in the morning. There were a few more passerines present than of late including a Dunnock, 111 Redwings, a late (possibly latest ever) Whitethroat at Ancum Willows, a few each of Blackcap, Chiffchaff and Goldcrest, the Tree Sparrow again, 142 Snow Buntings and 28 Twite. The male Northern Harrier was seen on both days as was the Whimbrel and there was also a Goldeneye and 9 Long-tailed Ducks seen on the 24th. The 25th was quieter with not much to report passerine wise but seen around the Lochs and Bays were 24 Whooper Swans, 7 Pintails, 10 Gadwalls and a late Arctic Tern while in an hours sea-watch passed 6 Sooty Shearwaters, 2 more Storm Petrels, a Puffin, 494 Kittiwakes and 204 Auk sp. There was no repeat of our magical double act from last year, while preparations for the evenings 'Harvest home' and George's 21st birthday celebrations also ate into some of the days birding time. The Northern Harrier seemed unfazed by the latest rougher weather being seen a number of times and with the wind having now decreased after the recent storm, most of the days other news came from a two and a half hour sea-watch session from dawn. 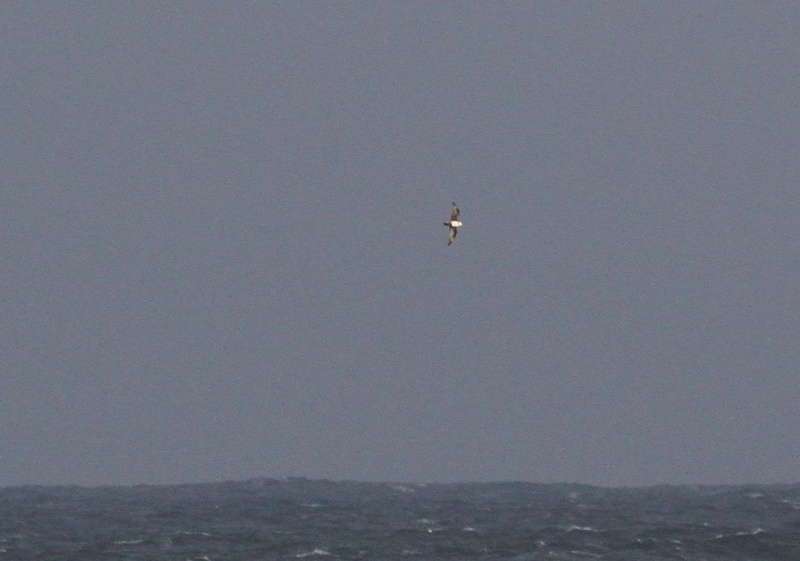 The highlights were the autumn's first 2 Little Auks, 3 Pomarine Skuas (2 adults and a juvenile), an Arctic Skua, 6 Great Skuas, 54 Sooty Shearwaters,2 late Storm Petrels and 4 Puffins while an hour long sample count also logged 216 Fulmars (including 4 'blue' phase birds), 42 Gannets, 270 Kittiwakes and 1001 Auk sp. 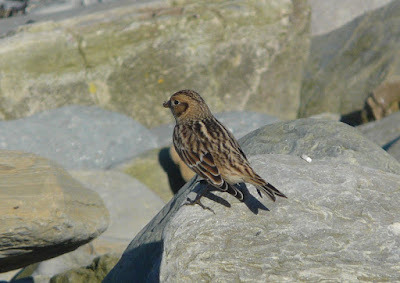 A couple of Crossbills also came in off the sea during the watch, a Long-eared Owl showed well in Holland gardens where the Spotted Flycatcher also remained and the Whimbrel was seen again. In stark contrast to nearby islands, we've been going through a quieter spell as birds continue to filter from the island and away south with just a few changes or newcomers every 24 hours. 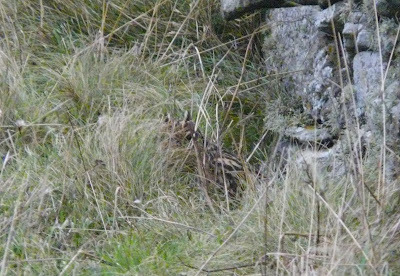 One such new bird was a Richard's Pipit found at Neven on 20th with the long-staying Gretchen individual again on 21st and both birds seen on a wild and windy 22nd. 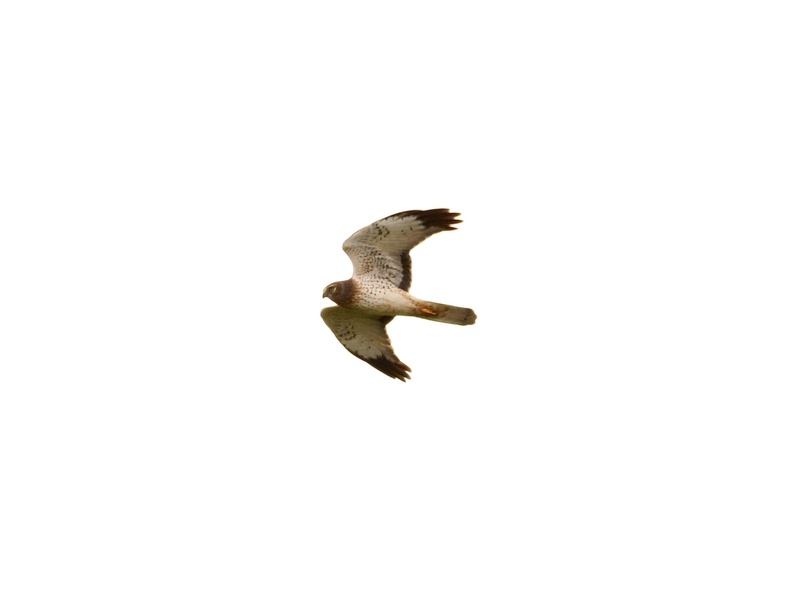 The male Northern Harrier has remained throughout as has at least one ring-tail Hen Harrier and the unseasonal Whimbrel. 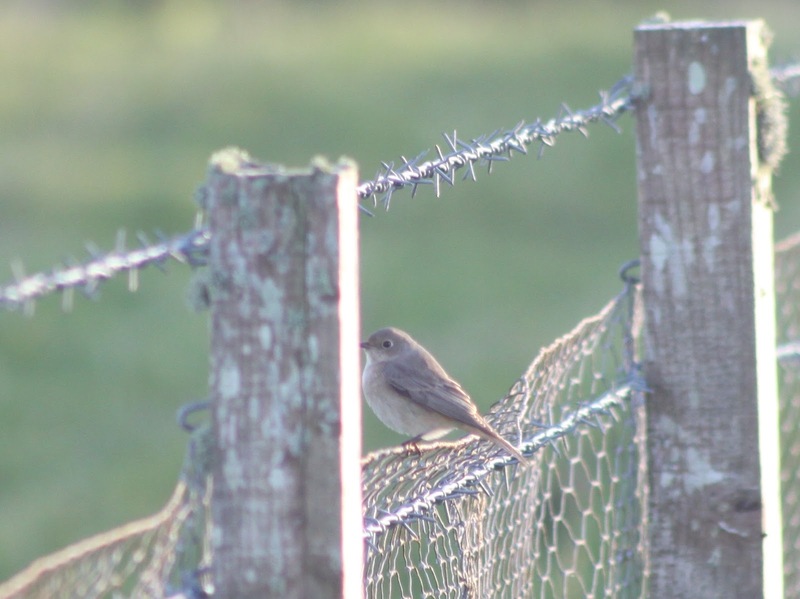 In lighter winds it was the first two dates which were the better for passerines with 3 Swallows, 5 Blackcaps, a Yellow-browed Warbler, Siberian Chiffchaff and a late Spotted Flycatcher on the 20th. This was followed the next day by counts of 6 Robins, 5 Wheatears, the best day for thrushes with 112 Redwings, 6 Fieldfares, 3 Song Thrushes and 21 Blackbirds, plus a Lesser Whitethroat, a new Siberian Chiffchaff trapped at the Obs, a Mealy Redpoll and 40 Snow Buntings. Swans, geese and wildfowl have passed through regularly including 8 Whooper Swans on 20th, 7 Barnacle Geese on 21st while migrating flocks of Greylag Geese have been witnessed coming in and out daily the highest total being 580 on the 22nd, on which date there was also a Pintail and the autumn high so far of 13 Gadwall. The best of the rest have been ones or twos of Merlin, Kestrel and Peregrine each day, the odd Jack Snipe and 2 Woodcocks and Black-tailed Godwits on the 21st. In light-south westerlies most movement took place early on, and with the wind starting to increase later in the afternoon it looks like the recent calm spell is coming to an end and we'll be back to more traditional wet and windy October weather. The decent start led to another day dominated by the busy morning ringing session at Holland gardens and over 100 Redwings were trapped and ringed for the third day running. Their total of 609 is relatively conservative with at least 250 of these headed straight out south in the first hour of daylight. 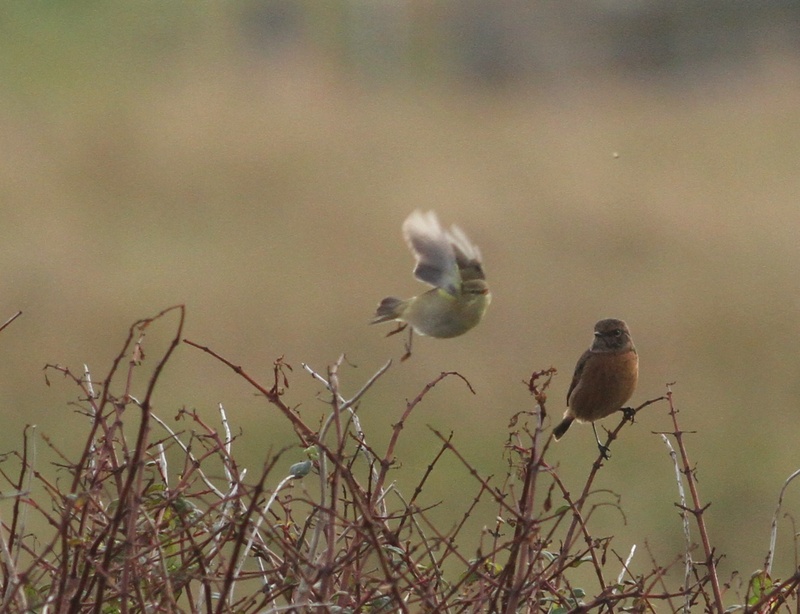 There were also 43 Blackbirds and 21 Fieldfares plus the Richard's Pipit still at Gretchen, 3 late Swallows, a Dunnock, 4 Robins, the Whinchat, 5 Wheatears, 7 Blackcaps, 3 Yellow-browed Warblers (which included new birds caught/ringed at the Obs and on the north links), 5 Chiffchaffs, only 23 Goldcrests (but many of these were thought to have been newly arrived), a Tree Sparrow, 2 Goldfinches, a Mealy Redpoll and 16 Snow Buntings recorded. The male Northern Harrier was seen early in the morning but it was the first Whimbrel for well over a month on the Links which was the main surprise of the day. 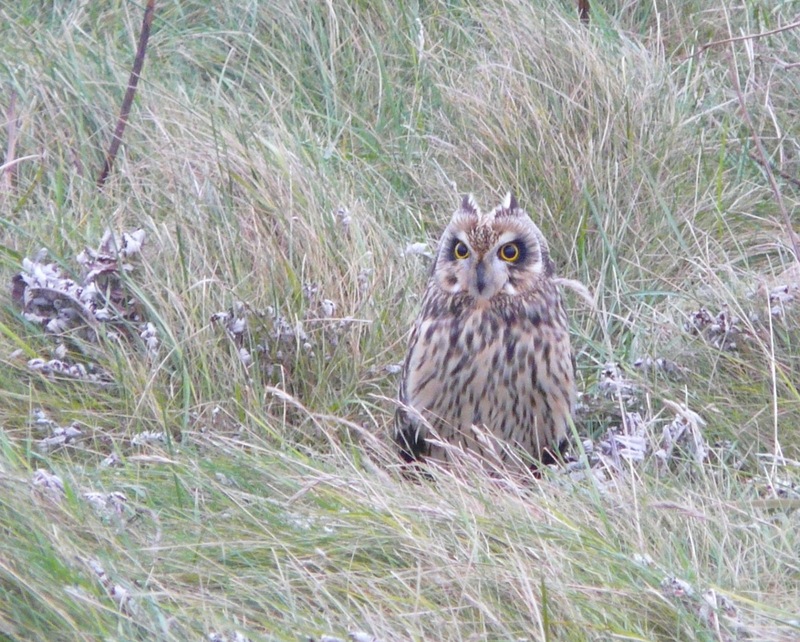 A Long-eared Owl caught at Holland gardens at dusk was well admired and also of note were 7 Sooty Shearwaters, a feeding flock of 1000+ Gannets in Nouster Bay, 7 Pink-footed Geese, 7 Barnacle Geese, a ringtail Hen Harrier, 2 Kestrels and 3 Merlins, a Jack Snipe and 3 Woodcocks. 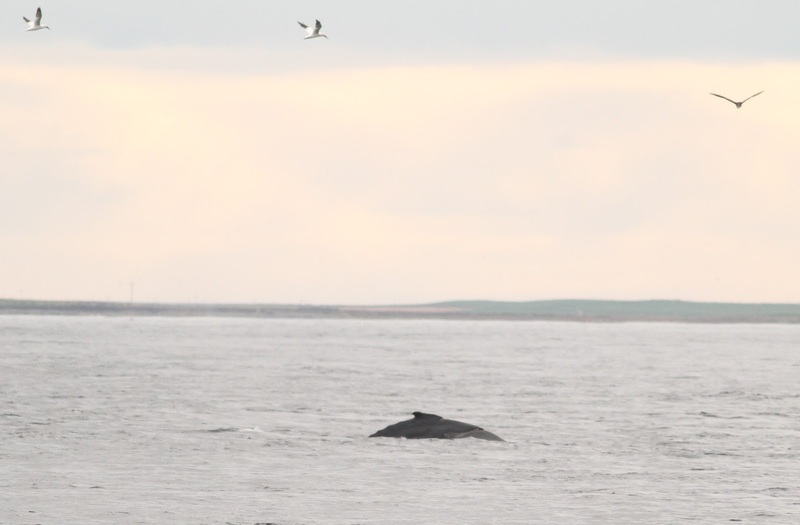 Any day with an island first is a special one, and today we were fortunate to have a magical encounter with a HUMPBACK WHALE - the first ever to be seen from North Ronaldsay shores. First seen under circling Gannets between Bridesness and Stromness points at around 11am it conveniently slowly made its way through the firth towards the Obs allowing all at the team, guests and several island residents time to get to the Pier and witness the event. 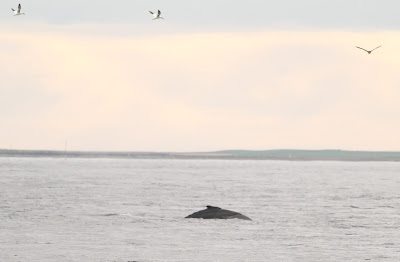 It came remarkably close to shore, always within half a mile and put on a great show, blowing 'frequently' and even brought its tail up and out of the water to dive deeper half a dozen times. 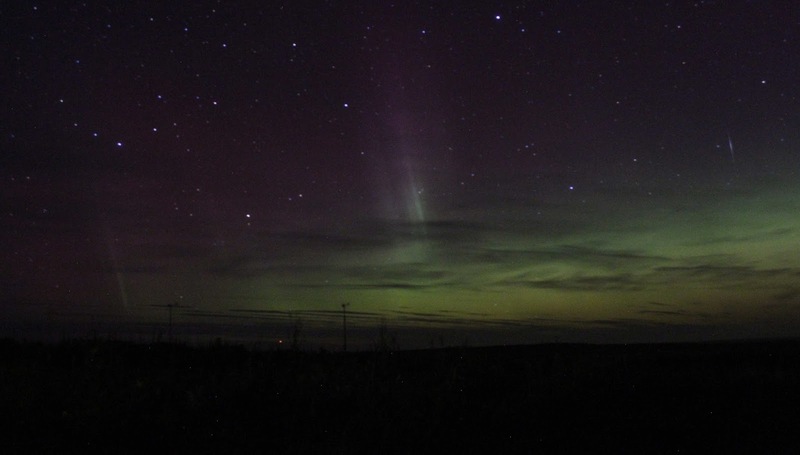 The whole experience lasted over an hour (our photos really don't do it justice) before this magnificent beast moved out to the west of the island and headed off in that direction with more purpose. All birds pretty much played second fiddle today, with the male Northern Harrier the highlight again and today it was seen in the company of an adult male Hen Harrier for about 5 minutes further emphasising our belief of quite how different the two races (species) actually are! Understandably, the sea was well watched resulting in 18 Great Northern Divers being logged and there was also another arrival of some 24 Whooper Swans and 10 Pink-footed Geese while 2 Kestrels, a Jack Snipe, 4 Great Skua's and 2 Short-eared Owls were also seen. On the passerine front, it was another busy day at the nets with over 100 birds caught and ringed again (mainly Redwings) and totals of 7 Robins, the Whinchat, 9 Wheatears, 36 Blackbirds, 556 Redwings, 37 Fieldfares, 7 Song Thrushes, 17 Blackcaps, a Yellow-browed Warbler, 9 Chiffchaffs, 5 Siberian Chiffchaffs, a Willow Warbler, 38 Goldcrests, a late Pied Flycatcher at the Observatory, a small number of Finches which included the first Mealy Redpoll of the autumn plus 87 Snow Buntings recorded. Cloud overnight and a light south-westerly wind saw an impressive arrival of Redwings (many now appearing to be of the coburni race) during the first few hours of the day lead to a busy ringing session at Holland gardens as birds literally pirouetted out of the sky. Of the 518 birds logged for the day 140 were caught and ringed though other thrush numbers remain with 56 Blackbirds, 17 Fieldfares and 10 Song Thrushes recorded. Both the Northern Harrier and Richard's Pipit were still present and plenty of Greylag Geese passed during the day with 589 counted and 14 Barnacle Geese and 13 Whooper Swans also flew south. Other migrants included 44 Meadow Pipits, 27 Rock Pipits, a Dunnock, 6 Robins, 2 Lesser Whitethroats, 14 Blackcaps, 2 Yellow-browed Warblers, 9 Chiffchaffs, a Siberian Chiffchaff, Willow Warbler, 42 Goldcrests and 13 Bramblings. There was also an impressive feeding flock of 2000 Gannets off the north and west coasts which were perhaps responsible for attracting at least 1 Killer Whale which showed well, albeit briefly off Westness in the afternoon. Another day without any weather to speak of, well none to force much significant change in bird numbers present on the isle. The Northern Harrier continues to show well being seen a number times all over the island while the Richard's Pipit showed once in the south-east corner of Gretchen field again. 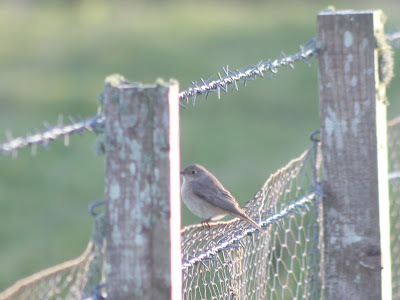 A Stonechat at the Observatory was perhaps the most noteworthy newcomer and the first of the autumn and there was also a Swallow, 12 Meadow Pipits, 24 Rock Pipits, 7 Robins, the interesting female Redstart again, the Whinchat, 15 Wheatears, a handful of thrushes, a Lesser Whitethroat, 14 Blackcaps, 4 Yellow-browed Warblers, 9 Chiffchaffs, 3 Siberian Chiffchaffs, 47 Goldcrests, 3 Lapland Buntings and 173 Snow Buntings seen. A calm sea saw 17 Great Northern Divers counted while the best from seawatching efforts were 4 Sooty Shearwaters, a late Puffin and 2 Arctic Skua's. A couple each of Hen Harriers and Kestrels remained, a Grey Plover was on Gretchen Loch and 24 Barnacle Geese passed over. The unexpected, calm spell continues with a similar range of species and numbers to yesterday although there is clearly some turnover of newcomers and departing migrants taking place on a day to day basis. 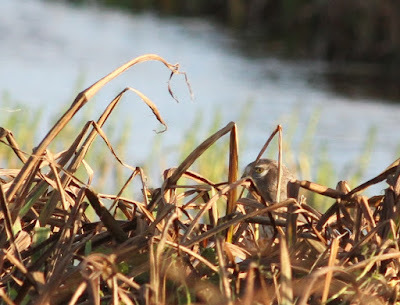 The days highlights comprised the Northern Harrier, a new Red-breasted Flycatcher at Senness, the Firecrest still at the Observatory, a Richard's Pipit at Gretchen and the Great Grey Shrike around the middle of the island. 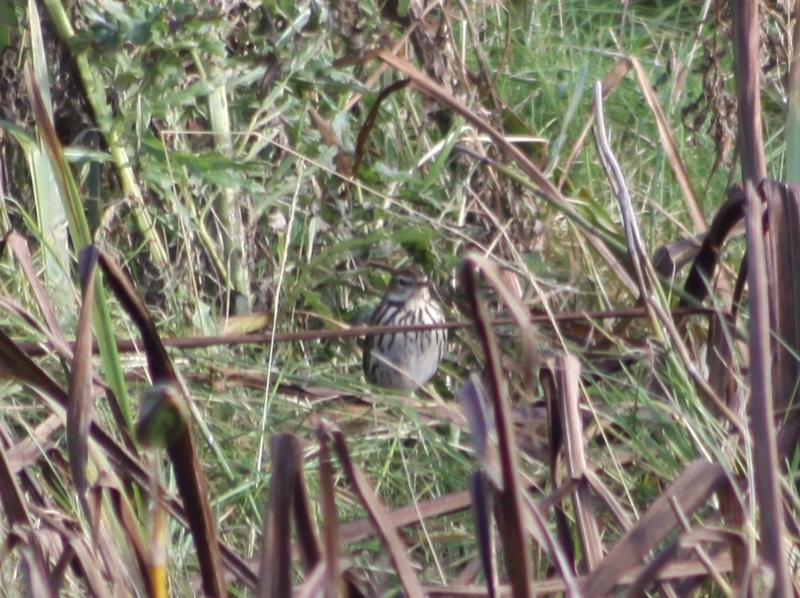 Noteworthy passerines included 64 Meadow Pipits, 26 Rock Pipits, a Tree Pipit, 3 Grey Wagtails, 9 Robins, 16 Wheatears, an increase to 44 Blackbirds, just 7 Fieldfares, 22 Song Thrushes, 169 Redwings, a Garden Warbler, 27 Blackcaps, 5 Yellow-browed Warblers (at least one a new bird), 9 Chiffchaffs, 3 Siberian Chiffchaffs, a Willow Warbler, 98 Goldcrests, 2 Chaffinches, 20 Bramblings and 2 Siskins. 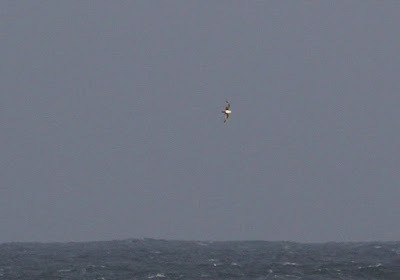 In rough swell off the east side of the isle fed 282 Common Gulls and joining them were 28 Black-headed Gulls - a good count for the time of year and there were also 2 'standard' Hen Harriers, 2 Kestrels, a Short-eared Owl, 6 Jack Snipes and 3 Geat Skuas seen. A clear night followed by a moderate, southerly breeze by morning encouraged many of yesterdays birds to move on but in their place came a fresh arrival of birds typified by the ringing session at Holland gardens which included just 1 re-trap among the 70 birds caught for ringing. There was another highlight too - this time a cracking little Firecrest found outside the Observatory just after midday and finding its way into a Heligoland trap a short time later. A commoner encounter for many of the team further south, its rarity here was well appreciated being just the fifth island record (that's the same as Pechora Pipit and Woodlark) and its the first since October 2011. The Northern Harrier was seen again several times, a Richard's Pipit which flew over the Observatory was new and the lingering Great Grey Shrike put in a brief appearance near Holland gardens in the morning. Also making it into the days bird-log were 9 Grey Herons, 2 Kestrels, a Short-eared Owl, the Grey Wagtail, a fresh batch of thrushes which included 29 Fieldfares and 368 Redwings, a Lesser Whitethroat, 12 Blackcaps, 3 Yellow-browed Warblers, 6 Chiffchaffs, a Siberian Chiffchaff at Ancum Loch, 76 Goldcrests, 9 Chaffinches, 19 Bramblings, a Siskin and 362 Snow Buntings. Who said the summer was over - it was another gorgeous, wind free, sunny day on North Ronaldsay which even began with a rarity when not long after 9am a Pechora Pipit was found in the Irises and tussocks between Peckhole and Hooking Loch. The bird was typically in its elusive behaviour but this the islands 5th record (or 6th if you were to take last years September record which wasn't accepted by the BBRC) showed well in flight frequently and was occasionally seen on the ground throughout the day. Later in the afternoon the male Northern Harrier made a surprise return, having presumably visited another part of Orkney's archipelago for a few days while the Great Grey Shrike remains in residence not too far from Hooking Loch. Numbers of some of the commoner species were slightly down on yesterday with 14 Robins, a Dunnock, the Grey Wagtail, a Whinchat, the interesting Redstart, fewer thrushes, a Reed Warbler at Longar, 2 Lesser Whitethroats, 20 Blackcaps, 6 Yellow-browed Warblers, 9 Chiffchaffs, 118 Goldcrests and a Lapland Bunting recorded. 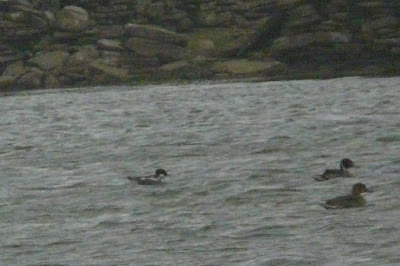 a couple of Ruff were probably new and the calm seas saw 2 Slavonian Grebes and 6 Long-tailed Ducks recorded. The wind had switched to a westerly direction and was refreshingly light though the forecast of occasional showers might have better read 'occasional dry spells' as it turned into an unexpectedly wet day. It was still one of the better ones of the autumn so far with some real highlights, headlined by the fifth island record of Woodlark which flew over the Kirbest/Holland area late afternoon. 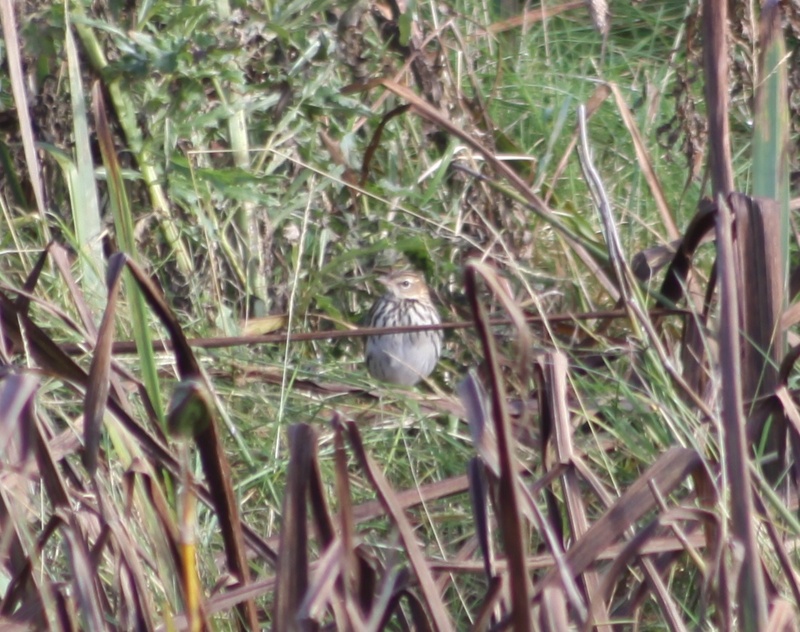 An Olive-backed Pipit in thistle fields near Kirbest was a predictable find - but still nice, a Red-breasted Flycatcher was discovered late on at Cursitter and the Great Grey Shrike was still near Hooking. 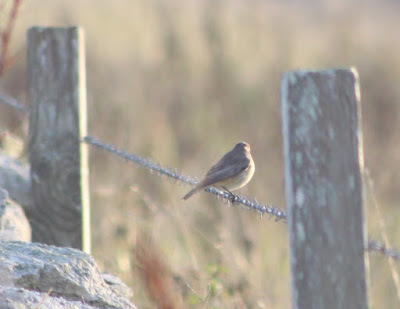 Without the wind, seeing birds was much easier and counted were 2 Tree Pipits, a Grey Wagtail, 15 Robins, the Redstart showing characteristics of the eastern form samamiscus again, 3 Whinchats, a Ring Ouzel, 42 Blackbirds, 27 Fieldfares, 73 Song Thrushes, 472 Redwings, a Reed Warbler (trapped at Holland gardens with another frustratingly elusive and brief Acro sp at Nether Linnay which may have been a Blyth's Reed or Paddyfield Warbler! ), 32 Blackcaps, 8 Yellow-browed Warblers, 16 Chiffchaffs, 2 Siberian Chiffchaffs (Howar and Stennabreck), 4 Willow Warblers, 184 Goldcrests, 9 Chafinch, 38 Bramblings, a Siskin, 4 Lapland Buntings and 242 Snow Buntings. Groups of Whooper Swans passed south early on totalling 21 birds with 135 Pink-footed and 5 Barnacle Geese also recorded. 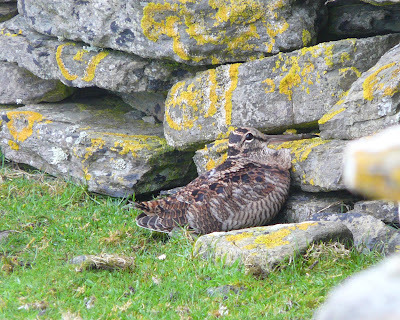 At least 4 Short-eared Owls and 3 Kestrels were seen, as were 7 Jack Snipes, 7 Woodcocks, the Common Sandpiper and 5 Black-headed Gulls while investigations into the identity of the wing of a Swift sp found underneath the Lighthouse are currently ongoing. The south-east wind which had pepped up during the night grew stronger as the day went on bringing with it a large number of migrants with Redwings and Goldcrests particularly prominent. Their respective totals of 1672 and 159 perhaps better treated as estimates while it was noticeable that the 'crests' were absent first thing but arrived in force from mid-morning onwards whereas many of Redwings had already gone by lunchtime. With the Harrier seemingly moving on the Temminck's Stint now on Gretchen Loch took top billing, with the Bluethroat still near Garso and a new Great Grey Shrike in the Hooking area the days other highlights. 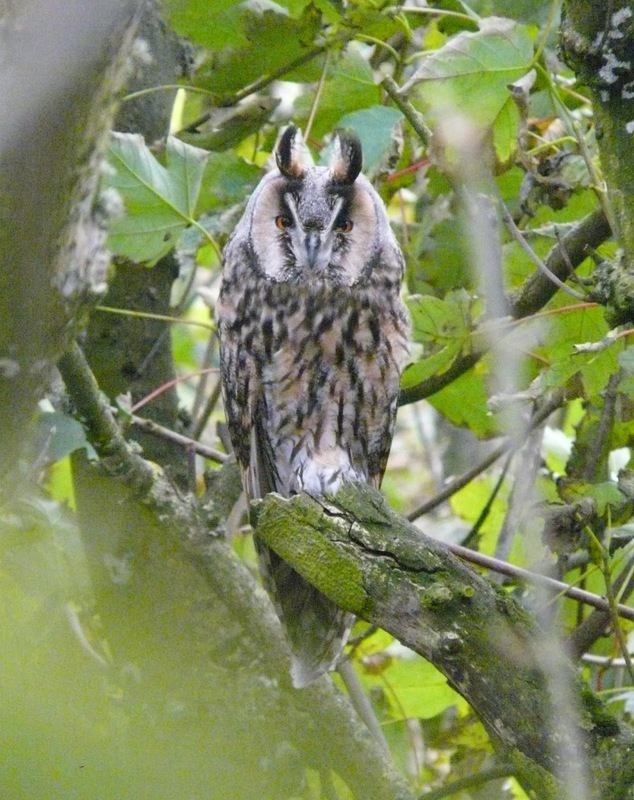 A Long-eared Owl at Ancum Willows was also nice to see and 2 Short-eared Owls were in the same area. 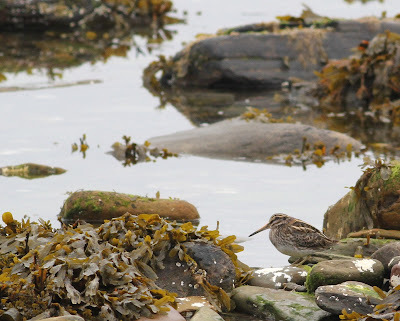 A Common Sandpiper at Stromness Point being so late was well scrutinised and Geese on the move included the first groups of Greylags in, and out south totalling 57 birds, 77 Pink-footed Geese and 18 Barnacle Geese. The day was all about common passerines and those seen included a Tree Pipit, a Grey Wagtail, 8 Robins, 2 Whinchats, 5 Ring Ouzels, 41 Blackbirds, 44 Fieldfares, 74 Song Thrushes, 15 Blackcaps, 6 Yellow-browed Warblers, 14 Chiffchaffs, a Siberian Chiffchaff at Brigg, 4 Chaffinch and 11 Bramblings. With rain due overnight - roll on tomorrow! A pleasant day with a light south-easterly wind brought a real surprise in the form of a Temminck's Stint at the north end. 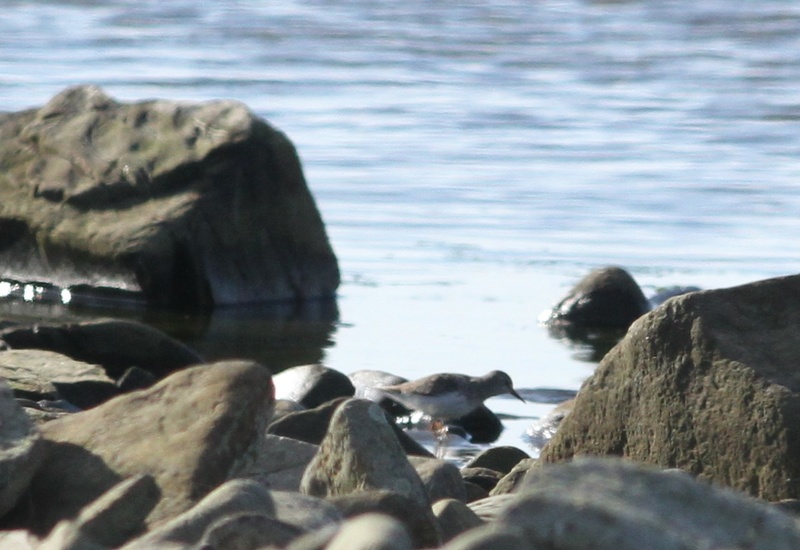 Initially on Trolla Vatn Loch, the bird (probably a juvenile) was mobile and particularly vocal, calling constantly and subsequently relocated to Bewan were this, just the 7th North Ronaldsay record of the species (and 9th individual) was well appreciated. 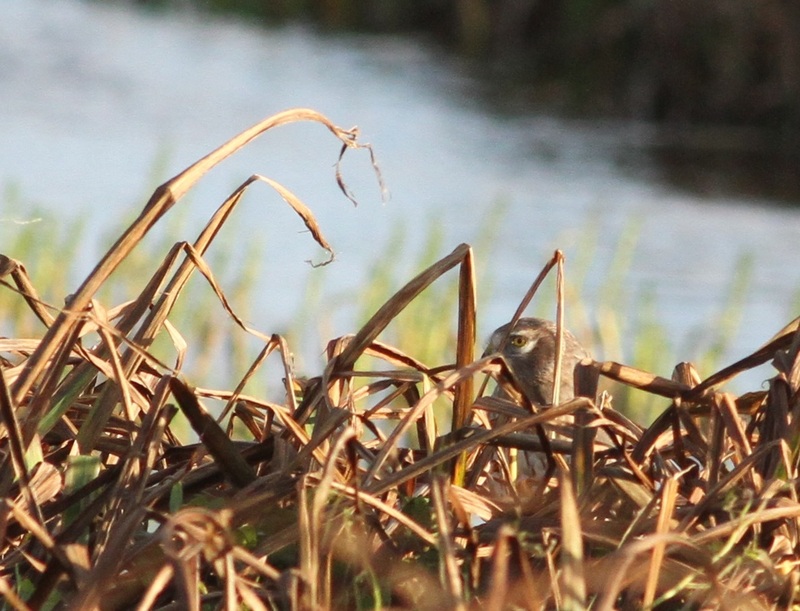 The Northern Harrier was seen again in the morning but not subsequently while the Bluethroat lingers on at Quoy Banks. One of the events of the day was the obliteration of the Tufted Duck record - the previous best of 69 birds on 1st October was doubled today with 140 present on Bridesness Loch bringing 6 Pochards with them for company. 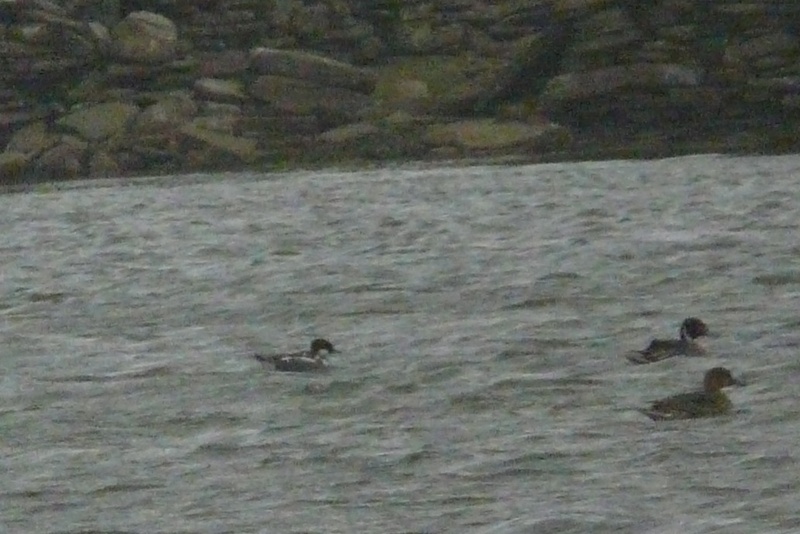 There were also 79 Pink-footed Geese, 27 Barnacle Geese, 26 Shovelers, 4 Jack Snipes and 2 Short-eared Owls. On the passerine front, Thrush totals were similar to yesterday but other species were generally down in number with a Grey Wagtail, Dunnock, 11 Robins and 3 Redstarts - including an interesting female at Nether Linnay with a prominent white wing panel and thus potentially showing characteristics of the Eastern form samamiscus. Yellow-browed Warbler numbers were up to 9 birds and there were 6 Chiffchaffs, 16 Blackcaps, a Garden Warbler, 17 Goldcrests and 159 Snow Buntings recorded. 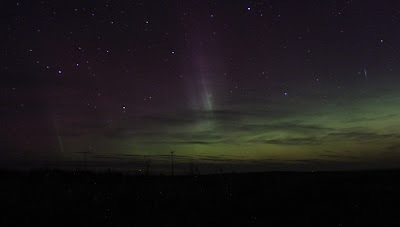 After a clear night, it perhaps wasn't surprising that 50% of yesterdays migrants appeared to have moved on. A Richard's Pipit south over Greenspot into the cool southerly wind was one of the few new birds present while the male Northern Harrier and the Bluethroat again showed well. A group of 20 Barnacle Geese lingered and at least 3 Merlins, 2 Kestrels and 2 Hen Harriers harassed the islands land-birds. There was also a Short-eared Owl, a late Ruff with 2 Jack Snipes more typical for the time of year. 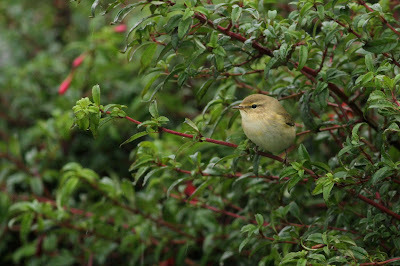 At least 6 Yellow-browed Warblers were still present and other warblers consisted of 10 Blackcaps, 6 Chiffchaffs, a Siberian Chiffchaff at Ancum Loch but just 9 Goldcrests, thrush numbers were roughly half those of yesterday, 7 Robins and 2 Redstarts seen along with 7 Chaffinches, 17 Bramblings and 236 Snow Buntings. 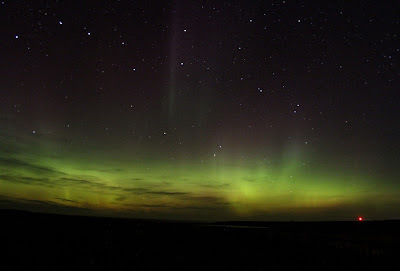 At last, the rain was gone, the sun shone and for 12 hours it felt like summer had returned to North Ronaldsay! A Great Grey Shrike at North Manse and Corncrake at Nether Linnay in the afternoon were the best of the new arrivals while the exact status (new or lingering?) 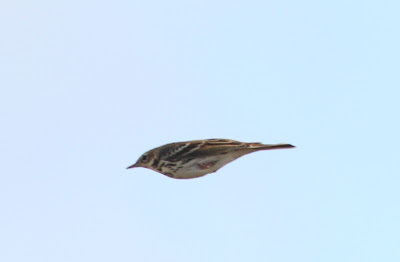 of a mobile Little Bunting was uncertain. The male Northern Harrier continues to tour the island and the Bluethroat also showed well at times. The first chance to open the mist nets for 2 days saw a Siberian Chiffchaff among 60 new birds trapped and ringed, with 2 Grey Wagtails, 18 Robins, 2 Redstarts, 10 Ring Ouzels, 43 Blackbirds, 4 Fieldfares, 125 Song Thrushes, 239 Redwings, a Grasshopper Warbler (Haskie Thistles still), 2 Garden Warblers, 30 Blackcaps, 11 Yellow-browed Warblers, 9 Chiffchaffs, a Willow Warbler, 30 Goldcrests, 11 Bramblings, 5 Goldfinches, 5 Lapland Buntings and 500 Snow Buntings all recorded. 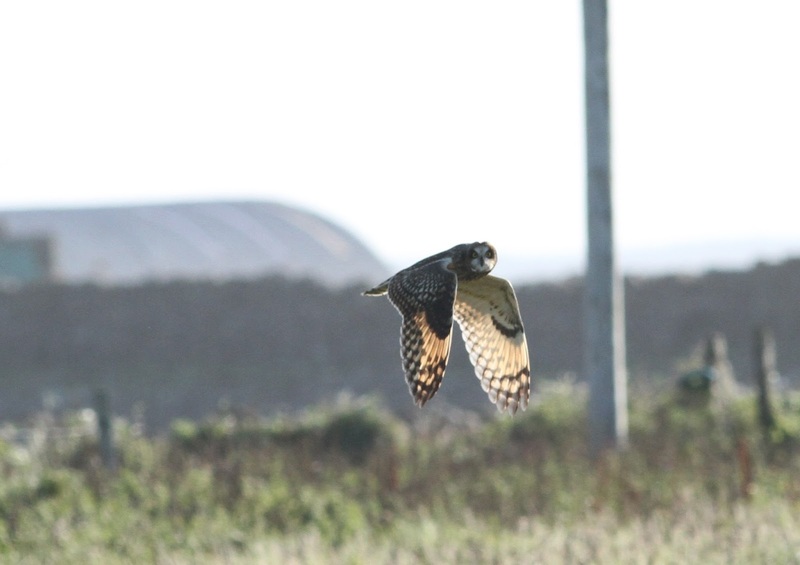 A couple of ringtail Hen Harriers joined their American counterpart at times and 2 Short-eared Owls, 10 Grey Herons, 78 Barnacle Geese, 4 Jack Snipe and 7 Woodcocks were the most notable non-passerines.